To remove packages, open \Mods\Packages\ folder. Also Delete Cache Files, for good measure. Go to this path and ensure that it is empty as well. If you have an Expansion Pack or Stuff Pack, you may want to verify the content for those respective folders in the Virtual Store are removed as well. The Sims 3.app is an application bundle, not a folder. To open it, right-click on it and select "Show Package Contents". Also, you can click the Downloads tab to get rid of the unneeded Sims3Packs that have already been installed into your game. Cache files are temporary files that are saved by the game to make loading certain information faster. If these files have incorrect or corrupted data, it may prevent your game from loading. The game will regenerate fresh copies of these files each time it loads, so deleting them is perfectly safe, and it's normal for them to reappear. You can also clear the Thumbnails cache of obsolete/corrupted items. These files will also be re-generated when the game is started. Create-A-Sim content is anything that is used on a sim, this includes facial hair, makeup, genetics and clothing. Generally removing the file from the game is good enough, but just to avoid any conflicts it's best to follow the steps below. 1. Remove the Package or Sims3Pack from the game. Deleting sims from the Sim Bin can be done in game. However, if you think a downloaded sim may be crashing your game, follow the steps below. 2. If the sim had a name, you should be able to easily locate their .Sim file and delete them. 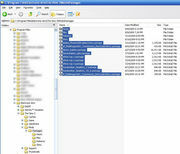 Sort the files by Date Created or Date Modified and find the file that's around the time you made the sim. If you have no clue when you made the sim then remove each file one by one until you find the right one. Lots can be easily be deleted in game, but if you feel that a lot might be crashing your game then follow the steps below to remove it. 2. Click the Installed Content button. 3. Sort the downloads by Lots and look for the lot you want to remove. 4. Press the delete button and let the Launcher uninstall the lot. and delete your compositorCache.package. If you have any world caches, delete those as well. Removing configuration files like Camera hacks and such is a tricky process. For starters, you have to locate the exact place that you installed the file. The easiest way to do this would be to go to the place you downloaded the hack from and reread the installation procedures. Once you found the hack DO NOT JUST DELETE THE FILE, I repeat DO NOT DELETE THE FILE. Non packaged files like .ini and .cfg files are not regenerated by the game like cache files, so if you delete them, your game will crash. Instead you have to replace them with the original file. Hopefully before you installed your hack, you renamed the original file to something like "filename_OLD.extension". If you did, then simply remove the hacked file and rename the original file to the appropriate name. If you didn't do the above, then you should be able to find all of the original files on your game disc. Simply view the contents of the CD/DVD and search for the file. When you find it, copy and paste the file into the appropriate directory letting it overwrite the old file. Most game mods can be deleted easily from your /Mods/Packages folder by following the steps here. Before deleting any mods, especially ones that directly affects a sim's action (ie. an animation hack) be sure that the sim is not doing the affected action/behavior. Interrupting a sim's action can cause, at the very least, them to "snap" to a random location...or in a worst case scenario, lot/loading crashes. This page was last modified on 11 July 2013, at 08:50. This page has been accessed 273,160 times.